I received this in an email from Catster, and had to share it with all my cat lovers out there! People sometimes call the average domestic cat a Tabby, but tabby is not a cat breed -- it is actually the pattern of kitty's coat. And it happens to be the most common of all the feline coat patterns. Technically speaking, no matter what color or markings you see on your cat, all felines possess the tabby gene. Other colors or patterns may hide those tabby markings, but they're always present. Sometimes you can see those faint tabby markings on a solid-colored cat who is sitting in the bright sun. And have you ever seen a solid red or orange or cream cat without the familiar tabby markings? You won't, because the gene that makes a cat red or cream also makes the tabby markings visible. All tabbies have thin pencil lines on their faces, expressive markings around the eyes, and a distinct letter "M" on their foreheads. Some believe the "M" is for Mau, the word for "cat" in ancient Egypt. Others think the "M" stands for Mohammed, who loved tabbies. Still others believe it is the blessing of the Virgin Mary. There are five types of tabby coat patterns, each possessing its own unique markings. We've listed them below alongside photos of Catster members who illustrate each pattern. The classic tabby has bold, swirling patterns along its sides -- much like a marble cake. It is called a "blotched tabby" in some regions. The pattern of circular smudges on the classic tabby's body closely resembles a bullseye. A mackerel tabby has narrow stripes that run in parallel down its sides. This is what some people refer to as a "tiger cat." The body has narrow stripes running down the sides in a vertical pattern. Ideally the stripes are non-broken lines; evenly spaced. They branch out from one stripe that runs along the top of the cat's back down the spine, resembling fish skeleton -- which is why the term "mackerel" is used to describe it. A spotted tabby has spots all over his sides. These spots can be large or small, and sometimes appear to be broken mackerel stripes. They can be round, oval or rosettes. Often, a mackerel tabby with a broken pattern resembles a spotted tabby. It is not known whether these spots developed from a mackerel tabby or come from a separate gene. A ticked tabby (sometimes called Abyssinian tabby or agouti tabby) does not have the traditional stripes or spots on her body, and may not, at first, seem to be a tabby. However, like all tabbies, this coat pattern has tabby markings on the face and agouti hairs on the body. What are agouti hairs? If you look up close at the lighter parts of a tabby's coat, you will see that the individual hairs are striped with alternating light and dark bands, known as the agouti hairs. 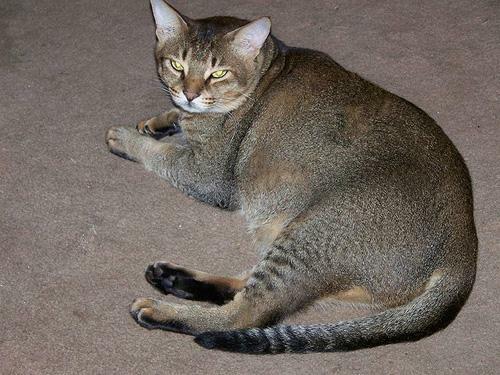 The ticked pattern is displayed prominently in Abyssinians but also appears in mixed breeds. This is the term used to describe a tortoiseshell (also called tortie) tabby. In the typical form, there are separate patches of brown tabby and red tabby on the same animal. 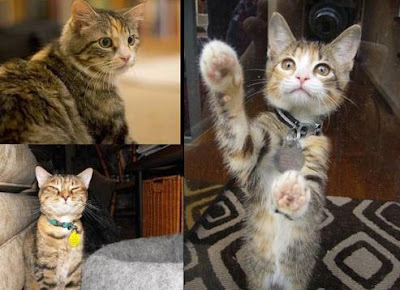 A tortie who also carries the tabby gene is often called a torbie. Patched tabbies can show any one of the above four distinct tabby patterns. The markings are usually more apparent on the legs and head. Thanks for the info. I often wondered about the generic label for cats. My cat is a mackrel tabby in apperance but more than likely has Siamese in her.